With Quentin Blake’s incredible illustrations popping up everywhere, I’m not surprised to find them in this book as well. What a delight! I confess that this is my first excursion into the world of David Walliams. I’ve only read the first page and I’m laughing already! Highly interactive, there’s not a page to be found which adults and children won’t enjoy reading. There is a map quiz, Shakespearean humour with a total lack of elegance, a quest to define your character, and the questionable antics of Raj, the energetic and less than creative newsagent and his alter ego Super Raj. Mrs Trafe’s Cookery Book Range will send your head spinning. There is a double spread on How to Draw Like Tony Ross, a game of Slides and Ladders, plus a granny with a jazzed up mobility scooter. But that’s not all. The whole book is chock-full of unexpected, unexplained, fun-filled pages of entertainment. I recommend this book to every child that dislikes books, wants a good laugh from clever comedy stretched to its limits, loves disgusting stuff, and has difficulties describing what they’ve just read. To them I say: this book is for you. 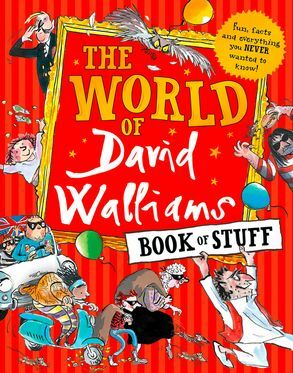 David Walliams’ intelligent word play, clever creative humour and lots of everything strange, is just what reluctant readers want in a book. The illustrated pages are filled with colour, bizarre characters and happenings. All this adds up to hours of laughter and fun that will draw children away from their electronic equipment and surround them with words that will be eagerly read.